The gut is hardly cocktail party conversation, but some would argue that it’s on its way to becoming just that. Not only is gut health a popular topic in scientific research, it has a following in food circles. An understanding of the association between food and the gut for increased immunity and overall health is gaining momentum, as is the RD’s role in preventing disease through the promotion of a gut-healthy diet. These beneficial probiotic bacteria do several things that contribute to good health and immunity. As Rao mentioned, their most basic function is to fight harmful foreign substances that enter the body by detoxifying them and easing their elimination. Probiotics can prevent the growth of harmful bacteria, which thrive and grow within a neutral pH environment, by producing organic acids such as acetic and lactic acids that, in turn, lower the pH of the large intestine. This lower pH also prevents the metabolism of cholesterol and bile acids in the colon. 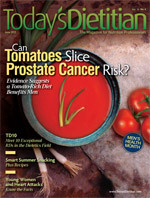 “Since cholesterol and bile metabolites act as cancer-causing agents,” Rao explains, “they can play an important role in the prevention of cancers of the GI tract and other organs as well.” These helpful bacteria, he continues, can even lower serum cholesterol levels along with cardiovascular disease risk by preventing the activity of an enzyme involved in the synthesis of cholesterol. Intestinal microbiota, or gut flora, and the gut barrier determine gut health. Inside the gut are about 100 trillion live microorganisms that promote normal GI function, protect the body from infection, and regulate metabolism and the mucosal immune system. In fact, they comprise more than 75% of the immune system. Also important is their role in maintaining and protecting the GI barrier. An intact GI barrier maintains gut health, while a problem with its microbiota composition will affect the body’s defense systems and can create a condition known as leaky gut syndrome, which can compromise gut health and lead to diseases such as inflammatory breast cancer, obesity, chronic fatigue syndrome, and depression. When it comes to gut health, Kathie Madonna Swift, MS, RD, LDN, coauthor of The Inside Tract: Your Good Gut Guide to Digestive Health, said in the March 21, 2012, webinar “Functional Nutrition and the Gut” that “diet and nutrition therapy should be the first route [to obtaining gut health], not the alternative. In Western medicine, they [prescribe] medicine.” Based on several studies, the current medical focus is on treatment rather than prevention. Several drugs exist to treat acute inflammatory bowel disease (IBD), for example, but none to prevent it. Swift says processed foods and today’s grains vs. ancient grains have a big impact on gut function. To help improve it and prevent disease, she counsels clients to feed gut flora by “plant centering the plate” and eating foods that are nutrient dense, high in fiber, and have a low glycemic load. RDs always have understood and counseled clients on the importance of food as preventive medicine and a maintainer of overall health. By recommending a balanced diet, exercise, and strategies to reduce stress as well as prebiotics and probiotics, RDs can support gut health in their practice. Now that medical research is beginning to make that food and gut-health connection, RDs will play a key role in what will hopefully be a shift in focus from treatment of GI disease to prevention. 1. Bischoff SC. ‘Gut health’: a new objective in medicine? BMC Med. 2011;9:24.